Relay Fight was introduced in Cardfight!! Vanguard G GIRS Crisis Episode 18 “TRY3 versus Asteroid“. Here is the recommended How-to-play Guide for Relay Fight! Relay Fight is a 3v3 tournament format in “relay” style. Form a team of 3 fighters with your friends, and determine the positions of every member: 1st Fighter (Vanguard), 2nd Fighter (Centerfield), 3rd Fighter (Captain). Within a team, every member must use a clan different from other members. Fight with 3 members in relay style! Both teams start with 1st Fighter. Once the 1st Fighter loses, the 2nd Fighter takes over, and once the 2nd Fighter loses, the 3rd Fighter takes over. The game ends once the 3rd Fighter loses. The 1st Fighter can take 5 damage before transitioning to the 2nd Fighter. The 2nd Fighter can take additional 3 damage after taking over, and the 3rd Fighter can take another 3 damage. In total, a team can take 11 damage. * When a fighter takes enough damage to lose, any extra damage that would be dealt is cancelled. E.g. : If the 1st Fighter has 4 damage already, and that fighter is hit by a Critical 3 attack, he/she will stop at 5 damage when passing to the 2nd Fighter. The remaining 2 damage checks will no longer be valid and will not be performed. When a fighter loses, the attacking side’s turn ends as well. All abilities are resolved, such as “when attack hits”, “at the end of the battle” and “at the beginning of the end phase of that turn”. After that, the losing team continues the fight with the next member. E.g. When “Divine Dragon Knight, Mahmud” hits the opponent’s vanguard and results in 5 damage for opposing 1st Fighter, “Divine Dragon Knight, Mahmud”‘s ability (choose one of your opponent’s rear-guards, and retire it) still resolves before the turn ends. The next fighter continues with the same cards on the field! Pass the baton on in your “Vanguard Relay”! When the battle is taken over by the next fighter, the previous fighter will collect the leftover cards in his deck, the face down cards in the G zone and the cards in his or her hand and remove them from the game. Any cards on the field will remain there, including face-up cards in the G zone, vanguard circle, soul, rear-guard circles, damage zone, drop zone and bind zone. The fighter taking over the battle will place his/her own deck, draw cards with the same number as the hand cards of the previous fighter plus an additional 3 cards, and continue the fight! 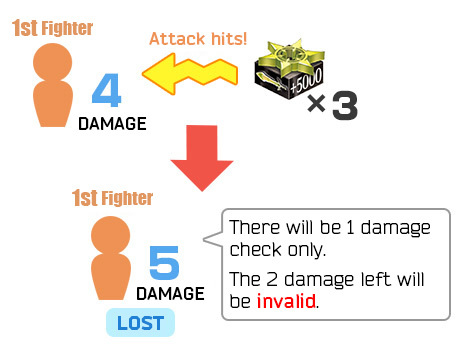 If the damage drops to 4 or below when the 2nd Fighter is fighting, or to 7 or below when the 3rd Fighter is fighting due to the effect of heal trigger etc., the previous fighter will not re-enter the battle. Special Rules for Relay Fight! 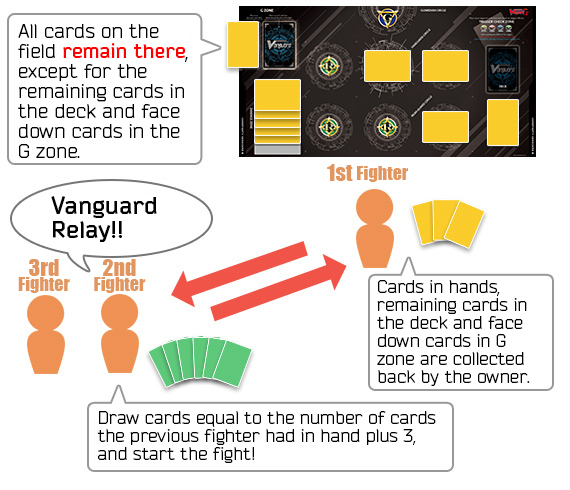 - The first vanguard cards of the 2nd Fighter and 3rd Fighter will be shuffled inside their decks. - When a card is returned to the deck, it is returned to the owner’s deck. E.g. 1: “Doctoroid Refros”: when cards are returned to the deck from the damage zone, the cards are returned to the owner’s deck, but shuffle the current fighter’s deck. After that, take the cards from the fighter’s deck to the damage zone, and then draw a card from the fighter’s deck as well. E.g. 2: When a card is returned to the deck from the drop zone due to Legion’s cost, the card is returned to the owner’s deck, but the Legion mate is searched from the fighter’s deck. - You cannot search cards from other member’s deck. - A card cannot be returned to your hand if it belongs to another member. - Restrictions of the “Lord” ability do not apply on the clans used by team members. Please make the decision of whether offering advice within a team can be allowed before the fight starts! After the fights, don’t forget to return the cards to your friends!